It's a tough decision for healthcare companies whether to insource or outsource EMR transcription due to the prohibitive cost of EMR implementation and inefficient billing practices. This leaves a vacuum in productivity thanks to ever-increasing demand for accurate and timely documentation. If this challenge is impacting your cash flow and long-term sustainability you need help now! Be it deployment of new EMR or revamping the existing one, outsourcing EMR transcription services to professionals like us is the smart choice. Outsource2india is an ISO certified provider of EMR transcription services. We facilitate undulating revenue by quickly turning your audio and paper-based medical records into digital format. Our efforts to help physicians become more productive has resulted in several successful client stories where we have rescued healthcare clients grappling with inefficient EMR implementation. When you outsource EMR transcription services, Outsource2india's team of EMR transcriptionist will carry out EMR services from inception to completion in the quickest and accurate manner. 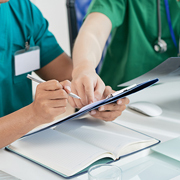 Clinicians who perform EMR documentation of patient encounters using handheld audio recorders can send dictated recording by uploading the same on our server. Why Choose EMR Transcription Services from Outsource2india? A team of Australia based radiologists sought assistance from O2I for transcription of 2000 STAT. Our team delivered on promises in quick TAT by learning to use a specific software. I am very impressed at the ease and the speed of the dictation service. They worked to my schedule and delivered well. I am very happy with the quality of the dictation work. I would highly recommend this service to my clients and my colleagues. I am very happy with the quality of the dictation work and look forward to working with Outsource2india in the future. Outsource2india is a trusted provider of EMR transcription services in India with a service footprint spanning across 140+ nations worldwide. Our commitment to delivering great client experiences along with transcription services make us a go-to partner for many physicians, clinics, and healthcare facilities. We have garnered the support of clients who have outsourced EMR transcription services. With over 80+ projects under the belt, we are routinely innovating and servicing customers with great velocity. Our cost-effective services can bring meaningful results to your needs as well. If you want a quick transcription of EMR records, get in touch with us. We will provide an irresistible quote in 24 hours.